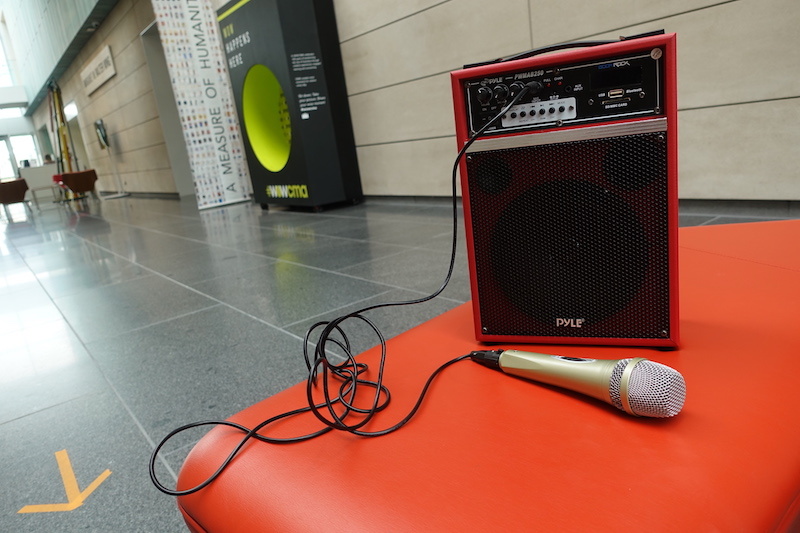 Tiny Speaker Concerts is our new online teen spotlight series connecting teens in our Teen Open Studio program with the museum patrons and collection. Teens choose an artwork to perform in front of and showcase the music they have recorded in our sound booth with the public. Teens then edit down the music video and share it online. The videos are recorded during Teen Open Studio Hours (Thursday 4-8 PM and Friday 2-5 PM), then posted on a monthly basis. This video features one of our most dedicated teens Carlos aka “Yavvane,” a local rapper who just recorded and released his first album, LIUBIS* (Load It Up, Because I’m Scared) on all digital music platforms. His album is a juxtaposed journey into the mind of the rapper. Alongside, heavy 808s and catchy instrumentals produced by another talented teen Kyle “Fulf” Fulford, Yavanne applies his raspy vocals and rhythmic rhyming style to make a very solid body of work. In this song, Hurry We Die Soon, Yavvane shares his struggle to find balance with things that he hates and loves within his world. Performing within Carmen Winant’s Lesbian Land installation in the Greater Columbus exhibition, Yavanne shares his thoughts from inside the house frame sculpture, and we as viewers remain on the outside. The visual is engaging and it’s almost as if we are receiving a sneak peek into the mind of the young artist. *The contents of the LIUBIS album are the views and expressions of Carlos “Yavanne” Head and not the museum. Some content on the Liubis Album is explicit in nature, so please seek parental guidance if you are under 18 years of age, before listening. -David Butler is an artist, educator, and illustrator, and leads Columbus Museum of Art’s Teen Open Studio and Art Lab program for teens.